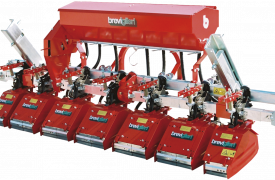 Multiple interrow tillers manufactured by Breviglieri are mechanical PTO-driven machines designed for soil cultivation between rows of plants which have already reached a certain height (sunflower, maize, tobacco, cotton, beet, vegetables and flowers in general) and for nurseries. 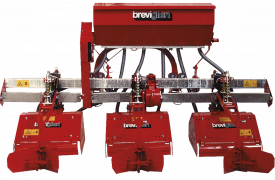 The interrow tillers mechanically shred, scarify and aerate the surface layers of the soil, improving its natural fertility and virtually eliminating the need for herbicides and pesticides. They also enable fertiliser use to be drastically reduced, resulting in considerably more abundant crop growth in a clean, eco-friendly environment and therefore greatly improved production yield per hectare. 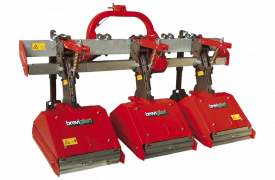 These machines consist of a one-piece frame and a series of independent cutting elements, which can be adjusted based on the different types of row crop or nursery requirements. They can also be fitted with different accessories such as a fertiliser spreader and a folding frame for road transport.